NuTech Products | Mason-Dallas Inc.
Mason is proud to offer NuTech Hydronic Specialty Products. 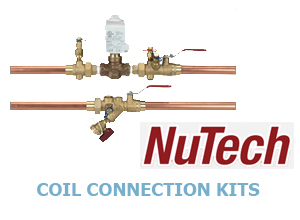 NuTech is the premier manufacturer of system balancing valves for hydronic heating and chilled water applications. They offer Automatic Balancing Valves, Manual Venturi Balancing Valves and a complete line of Coil Connection Kits, Components, and Accessories. NuTech product designs and final assemblies incorporate the highest industry standards to ensure Quality, Performance, and Efficiency. 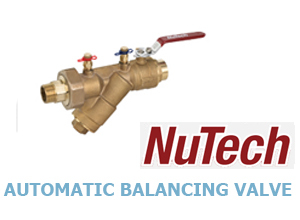 Nutech Automatic Balancing Valves are designed to maintain constant fluid flows regardless of pressure fluctuations due to load changes or system modifications. They offer cost saving at the time of installation and over the life of the system by reducing balancing cost, lower head requirements. 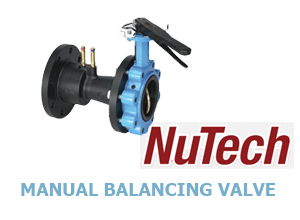 NuTech Manual Balancing Valves are efficient, accurate and user friendly. Models feature a low loss venturi section with dual readout ports. The design ensures significant energy savings as compared to typical circuit setters. They are highly accurate, ± 3% and are available to read flows down to 0.1 GPM. Easy to use, requires no special balancing valve calculator. Automatic & Manual Coil Connection Kits (CCK’s) are engineered package systems designed to eliminate on site confusion, reduce installation time and save cost. CCK’s are completely assembled, tested, bagged, tagged and boxed to your specific requirements. CCK’s may include balancing valves, Wye strainer, ball valves, temperature control valves, hoses and accessories.